Sent in by Chris Bowden: The Basix's were a Blues Band composed of Manchester University students. 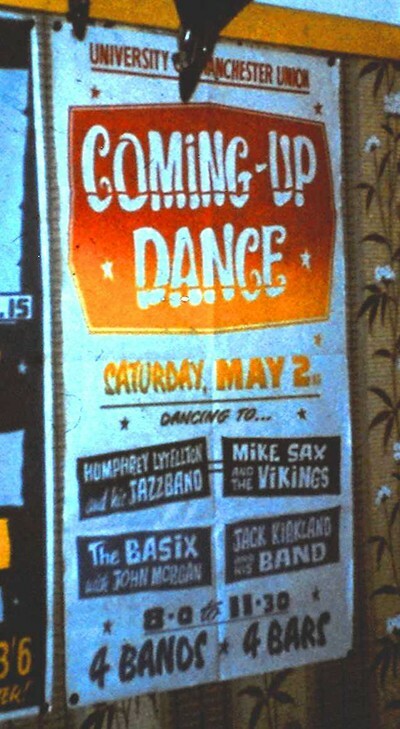 The main venue was The University Union, also at Owens Park and the J & J club (Jim and Josie) Stanley Grove. The only venue outside of the Mancheter area was at "The Place" in Hanley (Stoke on Trent) The Basix's took part in the Granada Television programme "The Blues Train" and travelled on the train from Manchester Central to the first closed staion on the defunct Fallowfield line where a preassembled audience awaited the train. After the passengers alighted and the train departed, a lone figure walked along the track and took up his place. This was Muddy Waters. Among many other famous blues artists were Sister Rossetta Tharpe.